Enjoy special offers on Kybella®, laser hair reduction, and more this month at Azura! June 21 may be the official start of summer but once Memorial Day passes, we have nothing but sunshine and sand on the brain! We have specials to keep you looking your best all summer long… and guys, that includes you too! 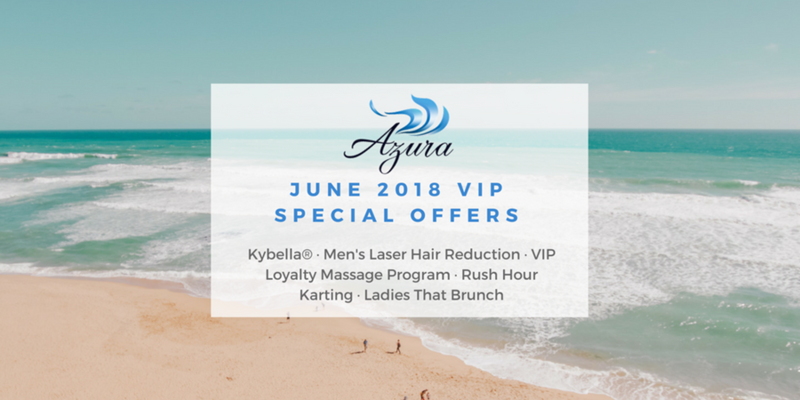 Keep reading for all of our VIP specials and be sure to RSVP for our fun upcoming events including a KYBELLA® Lunch and Learn, Rush Hour Karting, and a brunch fashion show! What could be more fun than a little Sunday brunching with your best ladies while sipping mimosas AND previewing all the latest summer fashion trends?! 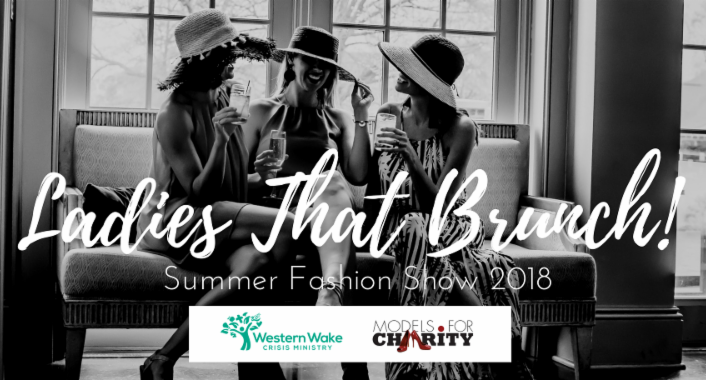 Wear your favorite summer dress and fancy derby hat and come brunch for a cause with Models for Charity to benefit Western Wake Crisis Ministry on Sunday, June 10 at The Mayton Inn, 301 South Academy Street in Cary. Ticket price includes a yummy brunch, bottomless beverages, silent auction, fashion show, swag bag, professional photography and our favorite resident DJ – DJ Supr. Door prizes will be awarded for the best hat and dress! 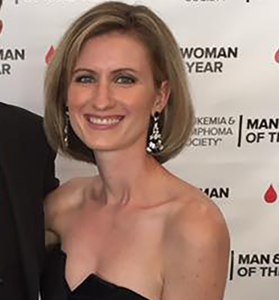 Amanda’s years of experience in aesthetics have provided her with an extensive knowledge of injectables and energy based technologies including light, laser, ultrasound, and radio frequency, for which she is certified. She loves to enhance a patients’ natural beauty and is well versed in dermatology. She enjoys offering patients comprehensive skin care consultations and is experienced treating all age groups, skin types, and ethnicities. 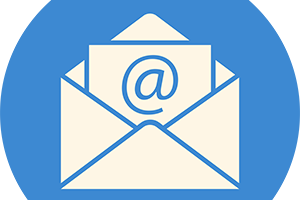 Schedule an appointment with Amanda June 6, 9, 13, 16, 20, or 23 and receive Botox for $11.50 per unit (regularly $13) or Dysport for $3.75 per unit (regularly $4)! Interested in having a more slender look around your neckline? 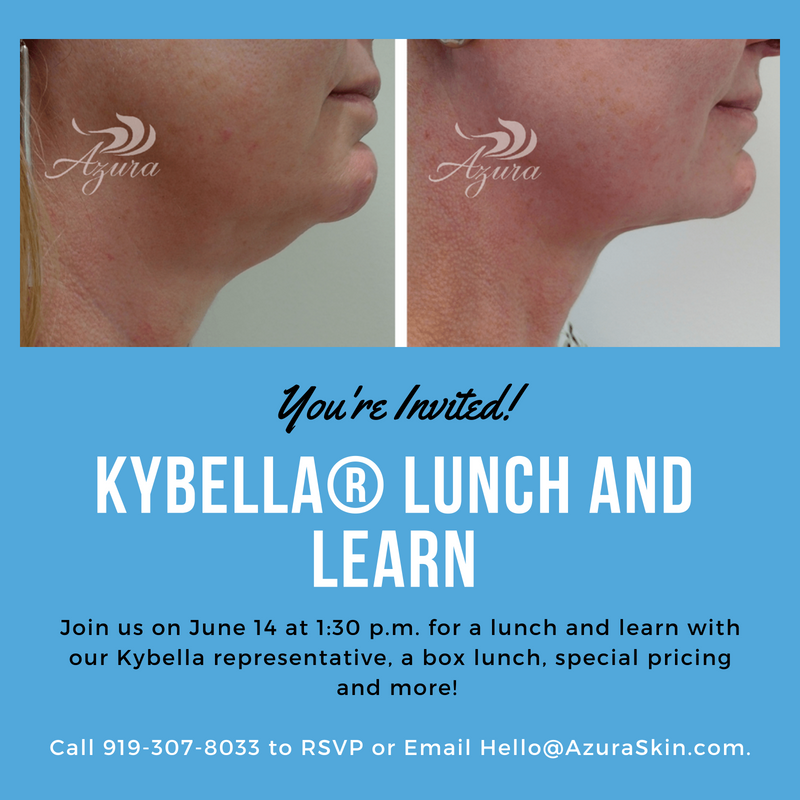 Join us for a lunch and learn with our KYBELLA® representative on June 14, 2018, from 1:30 to 2:30 p.m. Enjoy a box lunch, special pricing, and more! At the event, purchase two treatments for permanent submental fat reduction, AKA double chin, for just $1999 – which is $400 in savings! Treatment is based on 4mLs per treatment, which is the average amount needed for most clients. We are also throwing in a surprise gift worth $260 for everyone who purchases Kybella at the event! Guys – We’ve Got a Special For You, Too! Not sure what to get dad this year? We know what he really wants… laser hair reduction! Get that special man in your life bathing suit ready. 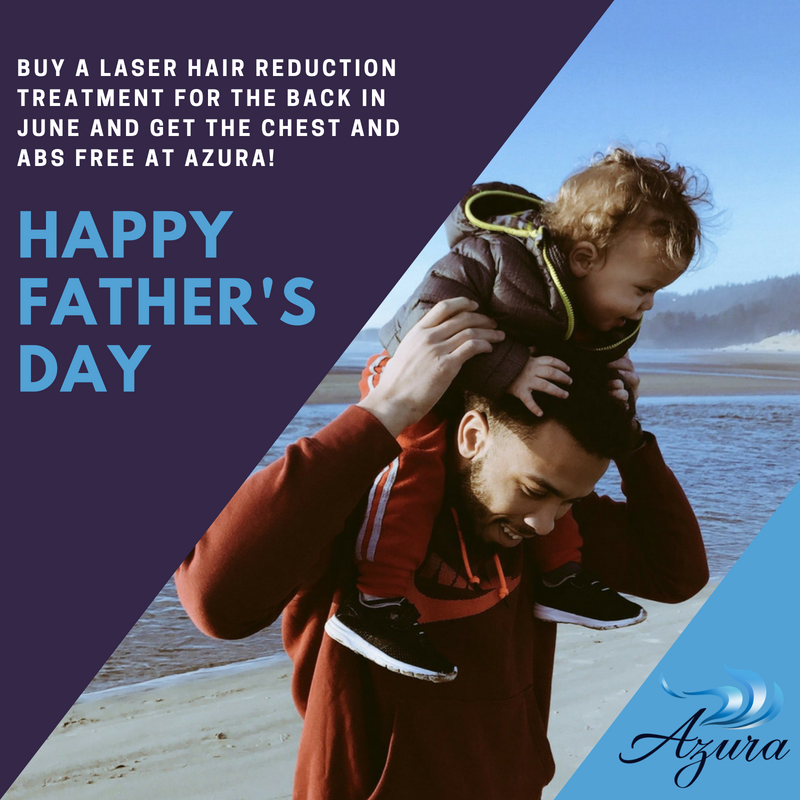 Purchase a laser hair reduction treatment for the back in June and get the chest and abs free! Buy a single session for a touch-up or purchase a package of six. That’s Not All, Dads – It’s Time to Tee Off! 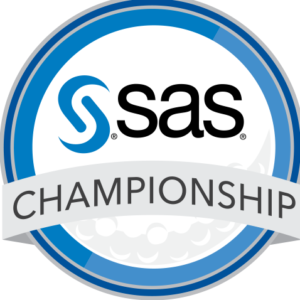 We are giving away a pair of Mellow Mushroom Chill Club Tickets to the SAS Championship on Friday, October 12, 2018. Any guys that come in for an appointment in the month of June will be automatically entered to win! We want to say “Thank you!” for being an Azura VIP client by challenging you to a little friendly racing! 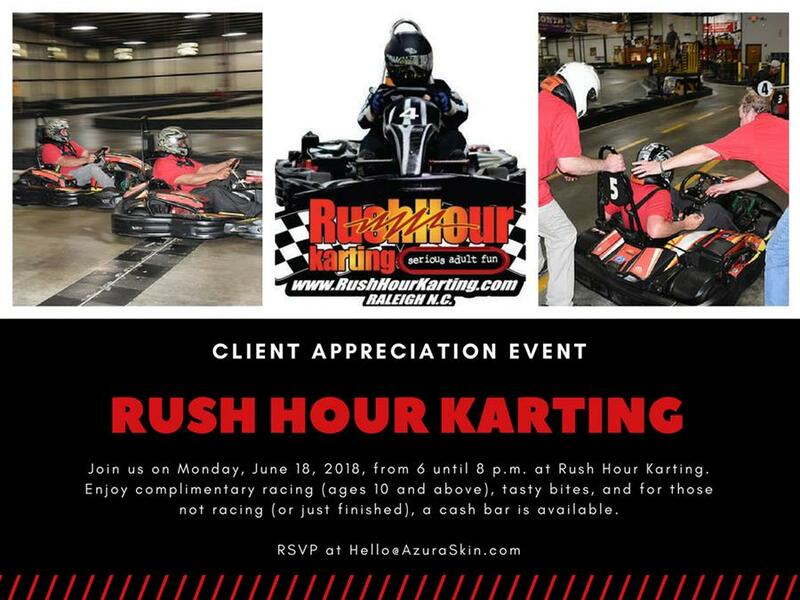 Join us on Monday, June 18, 2018, from 6 until 8 p.m. at Rush Hour Karting. Enjoy complimentary racing (ages 10 and above), tasty bites, and for those not racing (or just finished), a cash bar is available. 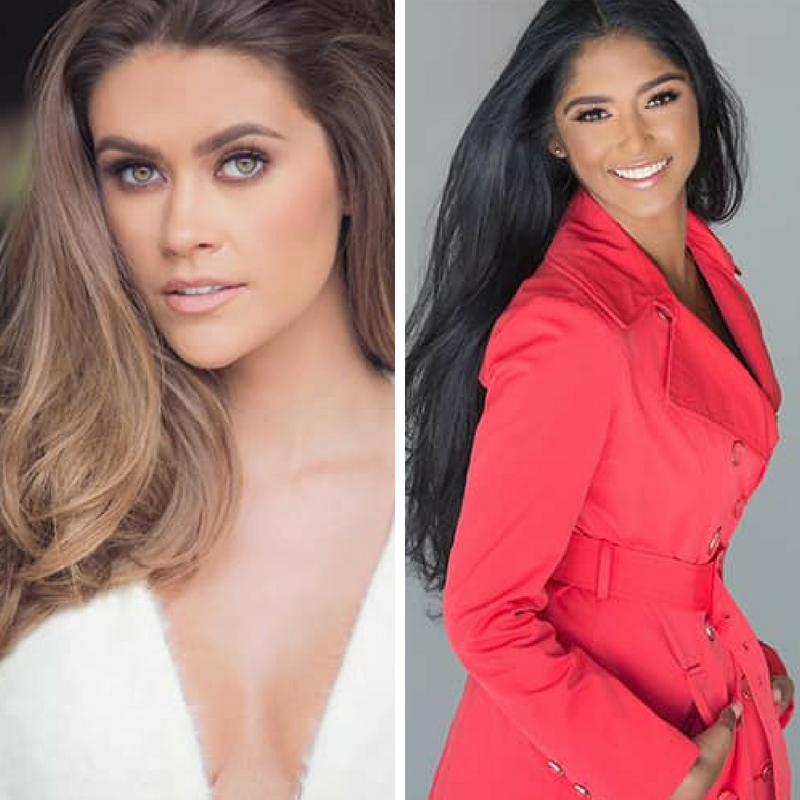 Congratulations to Caelynn on First Runner-Up for Miss USA and Kaaviya on making the top five on Miss Teen USA! We are proud to have been the official skin care provider and Med Spa sponsor to Miss NC USA and Miss Teen USA since 2016. It was an absolute pleasure helping Caelynn and Kaaviya get pageant ready. We are so proud of these amazing young women and wish them nothing but the best. We were especially excited when one of the announcers for Miss USA described Caelynn by stating “Now there is a Miss Universe face!” We couldn’t agree more! Join our VIP Loyalty Massage Program! 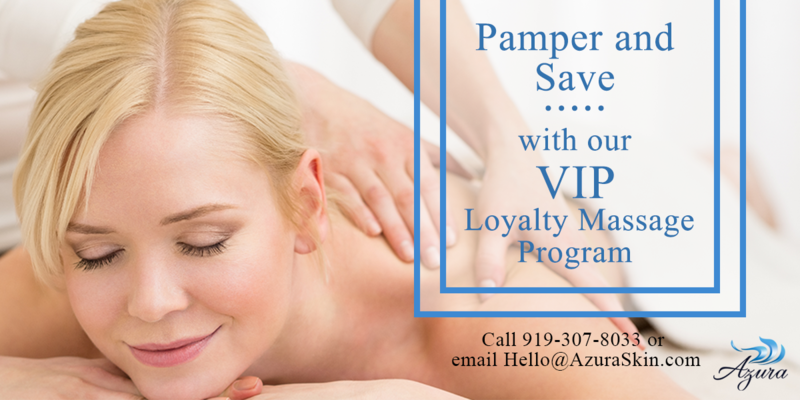 Treat yourself to a monthly massage or two at Azura Skin Care Center and save when you subscribe to our VIP Loyalty Massage Program!